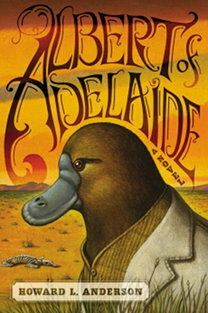 The novel begins with Albert the platypus staggering about in the parched desert next to the South Australia Railway tracks near Tennant Creek, somewhere north of Alice Springs. Albert has escaped from the Adelaide Zoo and is searching for … what? Expecting to die in the desert, and resolved to die as far north of Adelaide as possible, Albert stumbles into the camp of Jack the wombat. Jack has never heard of where Albert is looking for. Albert follows Jack to Ponsby Station, a ramshackle general store in a half-played-out mine site. Albert is naïve but he is no softy. When he runs into anti-platypus prejudice from the marsupials, he gets ready to fight. On payday for the marsupial miners, the Ponsby Station general store becomes a place of wild revelry. Albert gets drunk, wins the other animals’ money gambling, and falls asleep. When he awakes the next morn, Jack has burned the station down. He and Albert get out of town before the other animals can form a lynch mob and come after Albert for winning all their money and for being a platypus. Jack, feeling guilty, insists that he always causes trouble and that Albert will be better off without him. They divide their supplies, including Jack’s extra revolver, and Albert leaves. Albert headed toward the light, which grew brighter and brighter until he rounded a boulder and came to its source. A large one-story wooden building stood at the edge of the boulder field, and a number of lamps hung from its side. Torches had been planted around the front of the building and large canvas signs were hung from poles on the top and at the sides. The largest sign, lit by paraffin lamps with reflectors, was on the roof of the building. It read “WELCOME TO THE GATES OF HELL.” One sign on the side of the building read “WHISKEY AND AMMUNITION”; another read “DRY GOODS.” A smaller sign by the front door read “RELIGIOUS MEDALS, MAPS, FEMALES,” although someone had taken a paintbrush and crossed out the word FEMALES with a couple of rough strokes. Just as Albert finished reading the signs, a large wallaby smoking a cigar walked out the front door of the building carrying a skyrocket. He wore a white tuxedo jacket and was missing half an ear. The wallaby walked over to a section of pipe that had been pounded into the ground near the front door. He put the rocket in the pipe and lit the fuse with his cigar. Then he stepped back and watched the rocket shoot upward. After the rocket exploded in the sky over the building, the wallaby turned to go back inside. As he turned, he noticed Albert standing by the boulder. 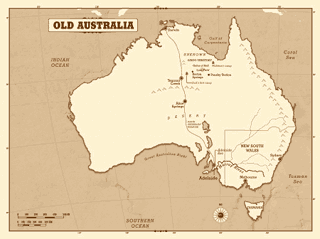 Albert of Adelaide is similar to another classic picaresque novel, Twain’s Adventures of Huckleberry Finn. It’s full of rough-and-tumble small towns that Albert has to leave in a hurry after a shootout. In fact, one of the next friends and role-models he meets is Terrance James Walcott, a raccoon holdup artist and claim jumper from the California gold camps who escaped from San Francisco barely ahead of a Vigilance Committee mob. 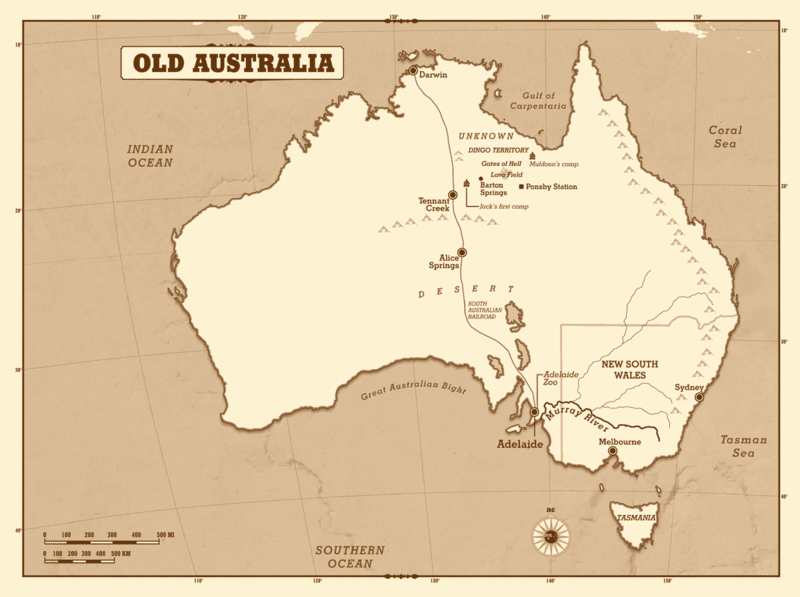 By now the reader will have realized that Albert of Adelaide has segued from current people-inhabited Adelaide and the modern continent-spanning South Australian Railway to a 19th-century Northern Australian landscape of frontier mining camps inhabited by anthropomorphic Aussie animals; marsupials who aren’t familiar with a platypus from the Murray River and who don’t trust strangers. Albert, at first an outsider unsure whether he should abandon his search for Old Australia, becomes the leader of the odd group of animals opposing the scoundrely Bertram, the white tuxedo-wearing wallaby and Theodore, his murderously psychotic possum henchman who are tricking the citizens of Barton Springs into making them Constable, then Mayor, and finally General of the marsupial community, out to exterminate the dingo aborigines. Albert of Adelaide is a fine anthropomorphic novel, with a rich cast of Australian animals and one raccoon immigrant. Like Grahame’s The Wind in the Willows, the animals segue confusingly between being clothes-wearing imitation humans and natural animals, and being their real sizes and all human-sized. Individual clothes-wearing kangaroos hop, but a townful of them walk like humans. But the animals’ natural abilities figure in many scenes. The desert-dwelling marsupials are unfamiliar with platypuses, and on several occasions Albert’s poison spurs prove to be a powerful secret weapon. This novel should please all Furry fans. I had tried to find an image of the full wraparound dust jacket, but all that I could find was the front cover. Interestingly, I kept running across illustrations of the different covers of the Australian and British editions. Five years later: Anderson has just self-published “The Famous Captain Walcott”, the first of two sequels, on Kindle. He says on GoodReads that he’s been unable to sell them to any publisher.